A digitizer is an electronic acquisition device that acquires analog waveforms, processes them through analog-to-digital converters (ADC’s) and sends the digitized sample to a buffer, which allows them to be saved before being processed by a computer. Historically, modern digitizers date from the 1950’s and 60’s when the need to rapidly acquire, store, and process multiple channels of data became evident. Most early digitizers were built on NIM (Nuclear Instrumentation Module) or CAMAC (Computer Automated Measurement And Control ) interface standards. These are standard bus and modular crate electronics standards for data acquisition and control used in nuclear and particle physics experiments. The creation of a standard instrument interface bus(GPIB/IEEE 488) in the 1970’s laid the foundation for multi instrument test and measurement systems. Concurrently the development of personal computers led to a number of standard computer interfaces such as PCI (Peripheral Component Interconnect )and VMEbus (VersaModular Eurocard bus) providing a standard interface to interconnect peripheral devices within a computer. These computer buses were adapted to support modular instruments by the creation of a number of modular instrument interface buses such as PXI (PCI eXtensions for Instrumentation) and VXI (VME eXtensions for Instrumentation). The increasing need to reduce test time and data though put resulted in the development of the LXI (LAN eXtensions for Instrumentation) Standard for test system integration. So, all the elements for fast multichannel instrumentation systems are in place. 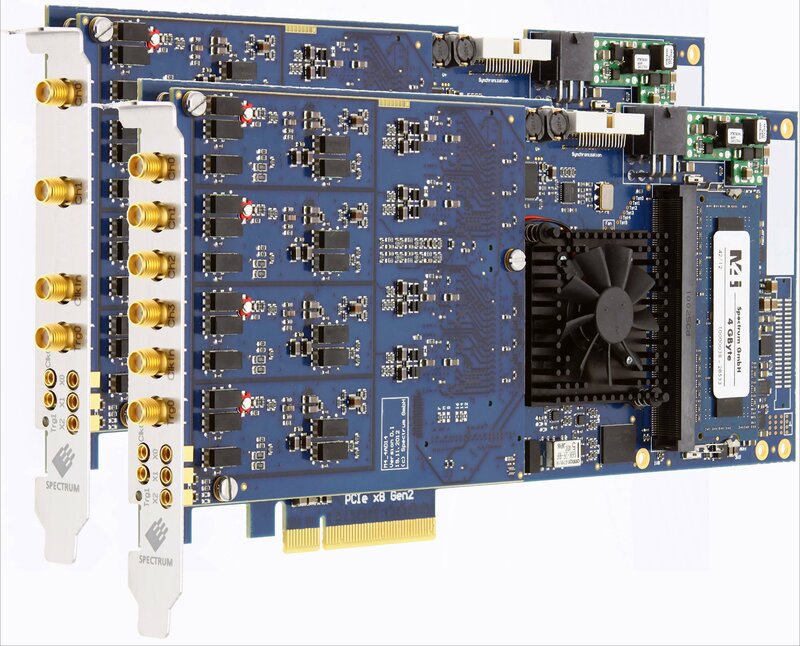 Today’s modular digitizers share a common historical architecture augmented by new high speed serial interface standards such a PCI Express (PCIe). Figure 1 shows an example, the Spectrum M4i series digitizers offering 2 or 4 channels with a sample rate of up to 500 MS/s and up to 16 bits of resolution with a PCI Express x8 Gen2 interface which supports transfer rates of up to 3.4 GBytes/s. Acquisition Memory: Digital data from the ADC’s is stored in a high speed buffer memory called the acquisition memory. The depth of the digitizers acquisition memory determines the length of a signal that may be stored in the buffer before it must be transferred for processing, display, or saved. Longer memory also allows for a higher sampling rate over extended record times. Analog-to-Digital converter (ADC): An analog-to-digital converter (ADC) transforms an analog signal captured by a sampler into digital data that can be processed by a computer. Bandwidth (-3 dB): Digitizer bandwidth represents the frequency range that can go through the input without significant loss of signal amplitude. Bandwidth is typically measured as the frequency (in Hertz) where the signal amplitude falls to half the power (-3 dB) of the signal at a low frequency. Dynamic Range: The digitizers dynamic range determines the maximum and minimum signal voltages that can be measured in one acquisition. A large dynamic range allows for the measurement of signals that contain both small and large voltage components at the same time. Dynamic range is related to the digitizers resolution. Effective Number of Bits (ENOB): The resolution of an ADC is specified by the number of bits used to represent the analog value, ideally giving 2N signal levels for an N-bit signal. Unfortunately, all real ADC circuits and their associated pre-amplifiers introduce some noise and distortion reducing the ideal number of quantized levels. Effective number of bits (ENOB) is a quality measure of the dynamic performance of an analog-to-digital converter (ADC) and its associated circuitry. ENOB specifies the resolution of an ideal ADC circuit that would have the same resolution as the digitizer being specified. LXI: LAN eXtensions for Instrumentation. A local area network based system integration standard allowing fast communication between multiple instruments. Noise: Noise is a random fluctuation in an electrical signal. It is a characteristic of all electronic circuits, which generally add noise to the signal being processed. PCI, cPCI, PCIe: Peripheral Component Interconnect (PCI), compact PCI (cPCI) and PCI express (PCIe) are three types of interfaces that connect a digitizer or other component to a computer via the computer motherboard. These interfaces are primarily used for modular digitizers that are installed in the chassis of a computer. PXI (PCI eXtensions for Instrumentation ), PXIe: PXI is a modular electronic instrumentation standard based on an industry-standard computer bus. This standard forms a basis for building electronic test equipment by providing clock and trigger synchronization signals. Resolution: The resolution of an ADC is specified by the number of bits used to represent the analog value, ideally giving 2N signal levels for an N-bit signal. Resolution is important for measuring dynamic signals and small signals. Sampling Rate: The sampling rate, or sample rate, of a digitizer is the frequency at which analog signals are converted to digital data by the analog-to-digital converter. Effective measurement requires the sample rate of a digitizer to be least twice the frequency of the highest signal frequency, this is called the Nyquist rate. It is preferable to sample slightly higher than Nyquist. Signal Processing: Signal processing is the processing of analog signals or digital data created from the signals. Common signal processing applications include filtering, averaging, and spectrum analysis. 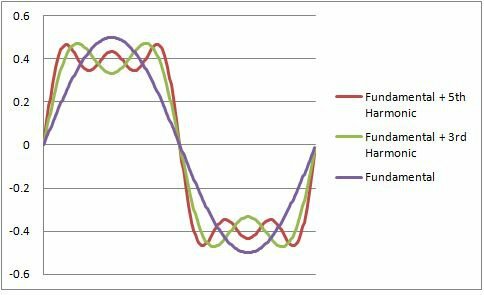 Signal to Noise and Distortion Ratio (SINAD): Signal to noise and distortion ratio (SINAD or THD+) is a figure of merit which provides a quantitative measurement of the quality of a signal. SINAD is the ratio of the total signal power level (including Signal + Noise + Distortion or SND) to unwanted signal power (Noise + Distortion or ND). It follows that the higher the figure the better the quality of the signal. The ratio is expressed as a logarithmic value (in dB) from the formula 10Log (SND/ND). Spurious Response: A spurious response is an undesired signal component that is added to the desired signal as a result of mixing with internal sources within a device such as an ADC. The maximum level of spurious responses is often specified as the spurious free dynamic range. Synchronization: Synchronization is the time coordination of events within a measurement system. It relates to triggering and sampling multiple channels or digitizers at the same time. Transient Recorder: Transient recorders or digitizers are electronic instruments for recording a fast transient signal such as a shock pulse. Trigger: A signal used to initiate and synchronize signal acquisition in a digitizer. VMEbus: VMEbus is a computer bus standard, widely used for many applications and standardized by the IEC as ANSI/IEEE 1014-1987. VXI: The VXI bus is an open standard platform for automated test systems based on the VMEbus. VXI stands for VME eXtensions for Instrumentation, defining added bus lines for timing and triggering as well as setting mechanical requirements and standard protocols for configuration, communication, mult chassis extension, and other features. Selecting a digitizer requires that you match the application waveforms to the key digitizer specifications. This section provides some common rules of thumb to aid in the selection of a digitizer. The required bandwidth of a digitizer depends on the nature of the waveforms you are measuring. For sine waves a bandwidth of greater than twice the maximum frequency is generally adequate. If the waveform is pulse-like with fast transitions it is preferable to use a bandwidth that is five times the frequency of the pulse waveform in order to capture up to the fifth harmonic. Figure 2 illustrates this point, in order to approximate a square wave the bandwidth should allow transmission of up to the fifth harmonic. The sampling theorem states that to avoid aliasing, the sample rate of a digitizer needs to be at least twice the highest frequency component in the signal being acquired. Sampling at just twice the highest frequency component is not enough to accurately reproduce fast edges in time-domain signals. Accurate digitizing of a signal requires the digitizers sample rate should be at least three to four times the required bandwidth. 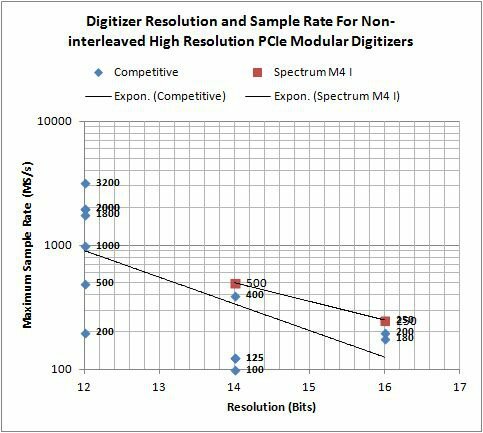 Resolution determines the dynamic range of the digitizer. The dynamic range is the ratio of the highest to the lowest signal level a digitizer can handle. Applications that involve dynamic signals (signals with both large and small voltage components) need a high-resolution instrument. As a first order estimate of the required dynamic range divide the highest signal level by the smallest signal level that is expected. As an example, consider a full scale range of 1 Volt and the desired minimum detectable signal level of 100uV. The ratio is 10,000:1 or 80 dB. With 6 dB per bit this requires 13.3 bits of resolution in an ideal case with no additive noise, so a 14 bit digitizer would be required. Note that there is a tradeoff between resolution and maximum sample rate. Higher resolution comes at the price of lower maximum sample rate. This is shown in Figure 3 where the maximum sample rate for a number of competitive modular digitizers is plotted as a function of the number of bits of resolution. The 14 and 16 bit models of the Spectrum M4i series are plotted also showing their higher effective sampling rate. Resolution/samplerate is an area of major engineering tradeoffs. Note that it is possible to increase the maximum sample rate by interleaving multiple ADC’s but this process usually results in a decreased effective number of bits (ENOB) because of noise due to imperfect matching of the ADC’s gains, offsets, and linearities. When you compare digitizer resolution and maximum sample rate make sure that the digitizers specify if they are single or multiple interleaved ADC’s. Determines the longest record length the digitizer can accommodate in a single acquisition. It also affects the sample rate on any given record duration. Record length is equal to the sample period times the acquisition memory length. For a given digitizer record length the greater the memory length the higher the sample rate that can be used without overflowing the memory. Triggers synchronize data acquisition with external events. Effective use of a digitizer requires great flexibility in device triggering. 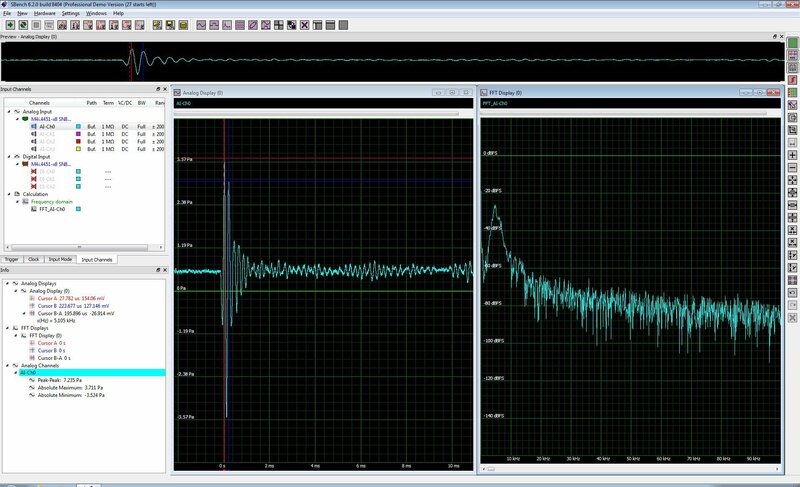 Simple edge triggers based on the slope and signal level are pretty standard on most digitizers. Many offer window triggering as well. Trigger sources include the acquisition channels and multiple external trigger inputs. For maximum trigger flexibility these inputs along with a rearm capability can be combined logically to produce advanced trigger states. Each modular digitizer has a specific number of channels per card. Using multiple cards can increase the total number of channels. In order to maintain synchronization, multiple cards need to be synchronized so that they share common triggers and a common clock. For example, up to eight Spectrum digitizers such as those shown in figure 1 can be linked with a Star-Hub module with no phase delay between channels. Digitizers generally offer a number of different acquisition modes. The Spectrum M4i digitizers offers ring buffer mode (similar to an oscilloscope operation), FIFO or streaming mode, Multiple recording (segment mode), gated sampling, and a multiple time base (ABA mode) which combines slow continuous recording with a fast acquisition on trigger events. These multiple acquisition modes feature a fast re-arm time. In the case of the Spectrum M4i digitizer it is as short as 40 sample periods (i.e. 80 ns at 500 MS/s). These different acquisition modes allow the user to configure the digitizer to best use the acquisition memory for different applications. One of the key advantages of digitizers is the ability to rapidly stream data to a computer for further analysis and archiving. The Spectrum digitizers, in FIFO mode (streaming mode), are designed for continuous data transfer between the digitizer buffer memory and PC memory. Utilizing a PCI Express x8 Gen 2 interface streaming speed is up to 3.4 GByte/s. Modern digitizers come in a variety of different form factors and standards. Today’s most popular are PCIe, typically used when size is critical and the digitizer needs to go inside the PC, and PXI. When building large automated testing systems, with a number of different test instruments, choosing a common form factor generally makes the integration task much easier. The Spectrum digitizers include drivers for Windows (XP, Vista, Windows 7 and Windows 8 (each 32 bit and 64 bit) and Linux (Pre-compiled kernel modules are included for the most common distributions like Fedora, SUSE, Ubuntu or Debian. The Linux support includes SMP systems, 32 bit and 64 bit systems). Programming example in Visual C++, Borland C++ Builder, LabWindows/CVI, Borland Delphi, Visual Basic, VB.NET, C#, J#, and IVI are included. If you intend to use third party software like LabVIEW1 or MATLAB1 drivers for these system integration packages and examples are also supplied. While most digitizers are controlled by user written software it is very important to have a manufacturer supplied software tool for direct control of the hardware for system integration and hardware verification. Spectrum offers such a program called SBench 6 shown in figure 4. This software is very flexible and can be tailored to match your requirements from single channel to hundreds of channels handling synchronization and of multiple modules. It also offers powerful measurement, analysis, and signal processing functions. In addition to showing the acquired waveform (the sound pressure level of an acoustic ‘click’) both cursor and parameter measurement are being displayed in appropriate units of sound pressure level (Pascals). The program includes the ability to do basic waveform math and advance calculations such as histograms and Fast Fourier Transforms (FFT). The FFT of the acoustic signal is shown. 1. Will you be troubleshooting a circuit, device, or process or making measurements that may require analysis and processing? The digitizer is the best tool if you will be measuring, analyzing or processing data. The intimate tie-in of the digitizer and computer makes them the instruments of choice where large amounts of data are to be processed. On the other hand troubleshooting requires the interactive viewing capability of the oscilloscope. 2. Do you need multiple channels in a small form factor with minimal power? This is the forte of modern modular digitizers, multiple channels per card and multiple cards per system all fully synchronized. Modular platforms such as the Spectrum M4i series can extend the number of analog or digital channels and analog and pattern waveform generation capabilities. 3. Do you need high measurement throughput? This is another area where modular digitizers excel. Multi-lane PCIe based modular digitizers can stream data at speeds of up to 3.4 GBytes/s allowing easy and fast processing within the computer. 4. Will the data acquired be processed by either commercial or custom analysis software? The high throughput and large buffer memories make digitizers a great source for integrating a measurement system with processing software. 5. Do you need to keep the cost of ownership low? Digitizers offer the lowest cost per acquisition channel, with ease of use, speed of integration, and reliability. Hopefully, when your next data acquisition requirement comes up you will consider a modular digitizer and reap the benefits of these excellent instruments.